The Amazing Acrobats of Shanghai is a spectacular show filled with incredible stunts and edge of your seat moments! You’ll see eastern dance, dazzling acrobatics, mysterious magic, mystical music, and more. There are over 40 entertainers that bring their amazing talents to the stage. You will see entertainers ranging from children to adults. Each have mastered their own unique stunts and they perform each of them with class! On top of the talent, the show also features awesome backdrops, amazing lighting, and special music. Celebrate the exotic wonders of China and enjoy the dramatic interpretation of classic Chinese dance and physical performance art. Be sure to stop by and say hi to the performers after the show. They’ll be out there to sign autographs and take pictures! 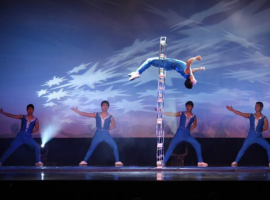 The Amazing Acrobats of Shanghai show can be found at Mickey Gilley’s Grand Shanghai Theatre. Catch their show daily either at 3pm or 8pm! For tickets, please click HERE.